The fossil fuels industry uses seismic imaging to detect and survey subsurface strata that may contain valuable hydrocarbons. These techniques are also vital for monitoring and validating subsurface carbon dioxide (CO2) storage. Such seismic methods rely on propagating low-frequency sound waves deep underground and then capturing weak return signals with an array of geophones. These sound waves travel far but they are also quickly scattered and absorbed, degrading the transmissivity, sensitivity, resolution of detection results. Researchers at PNNL are developing a new class of acoustically active nanomaterials—acoustic metamaterials—designed to improve high-resolution tracking of injected fluid into the subsurface. Importantly, the nanomaterials technology is compatible with conventional seismic and electromagnetic imaging techniques. A recent paper in ACS Applied Materials & Interfaces, led by geochemistry postdoctoral research assistant Quin R.S. Miller, marks the latest stage of progress in a two-year-old project funded by the DOE Office of Fossil Energy’s Carbon Storage program. The authors report, for the first time, how a class of metal-organic framework (MOF) materials exhibit acoustic properties. MOFs are being investigated at PNNL and elsewhere for a host of diverse applications, especially gas storage and chemical separations. 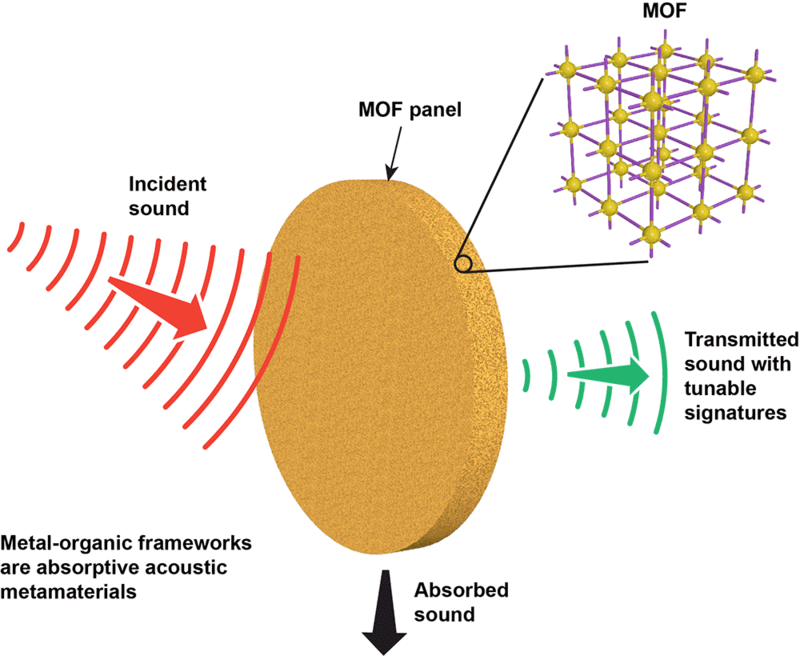 The new paper, however, marks the first time MOFs have been described as acoustic metamaterials and the first time their low-frequency acoustic properties have been evaluated. 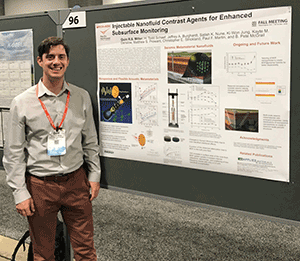 Once deployed in the field as stable injectable liquid, the authors say, the new acoustic metamaterials could disrupt current technologies and improve the way subsurface geophysical monitoring and mapping is done. To get their results, the researchers used air-filled impedance tubes to perform acoustics experiments on compacted disks of MOF particles. All but one proved to exhibit unusual absorptive properties. Geologists assessing hydrocarbon-rich fracture networks and carbon storage reservoirs utilize seismic pulses, low frequency soundwaves that can travel many kilometers through the subsurface. As they travel, however, the waves diminish in intensity (amplitude) because scattering and absorption that weakens the sound signatures of the seismic pulses returned to the surface. PNNL’s novel metamaterials are designed to enhance the contrast in the returned seismic signals. This allows for better monitoring of injectates, including CO2-rich fluids, and for better mapping of complex geologic structures. The project is under the direction of scientist B. Peter McGrail, the paper’s senior author. His research group is also advancing MOF research related to gas separation, sensor technology, and heat pumps. In a year’s time the acoustic MOFs project has moved from concept to laboratory-scale execution. By 2021, the authors estimate, the new technology will be ready to move from the scale of nanometers (in the lab) to one of kilometers (in the field). Agreeing was co-author Satish K. Nune, a senior materials scientist, who designed the MOFs evaluated in the paper. MOFs, familiar to researchers around the world in other applications such as sensing and gas separation, are a class of hybrid crystalline micro-porous materials made of metal clusters linked in a coordinated way to strut-like organic ligands. Broadly, metamaterials are synthetic periodic sub-wavelength arrangements engineered to alter the transmission, absorption, and reflection of waveforms impinging on the material. Those responses are dramatically different than the individual component materials. In the case of the new PNNL metamaterials, those special properties are acoustic. 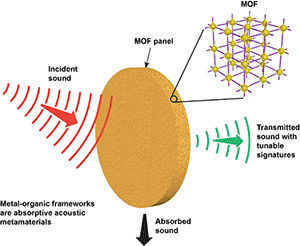 In the subsurface, the amplitude and frequency of incident sound waves shift when interacting with MOF-infused liquids. This gives rise to a response signature that is more easily detected and analyzed with conventional geophones. In the recent paper, the co-authors showed that their prototypical MOFs had anomalous acoustic properties. A second paper, slated to be submitted this spring, will report how the MOF contrast-agent nanoparticles can take on an injectable form that is water-stable. Meanwhile, the authors say, they will continue to work on other MOF candidates that have acoustic properties, and will combine modeling and experiments to demonstrate how MOF-infused injectable liquids can be deployed in the field, with an operational range measured in kilometers. 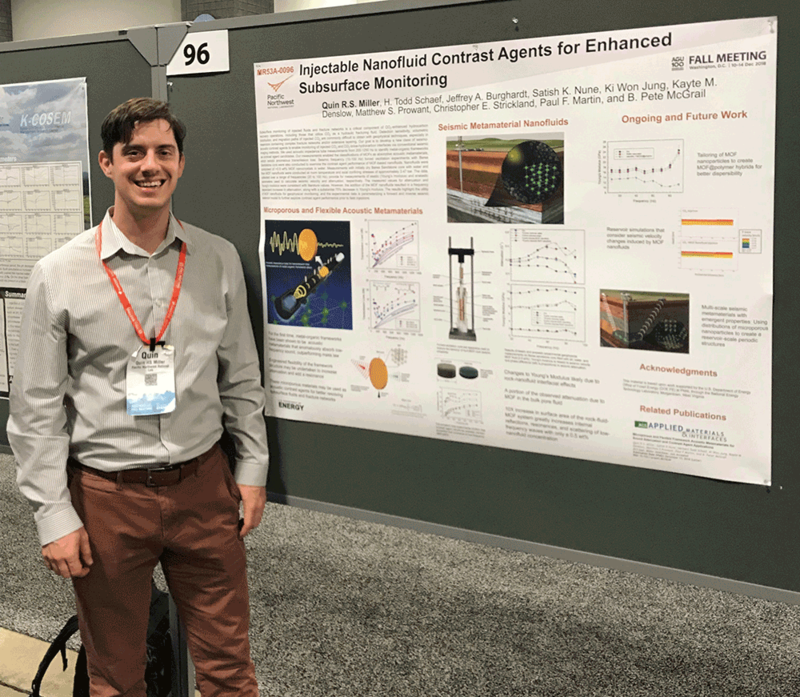 The recent paper by Miller and his co-authors say their acoustically active nanomaterials can lead to other promising applications. For one, they can be used as additives to construction materials that require superior sound absorption for detecting mechanical or structural flaws.